There’s currently a bit of a backlash going on against using a keyboard with your iPad. Putting a keyboard case on your iPhone (or iPad) is like attaching an outboard motor and pontoons to your car. See, that to me sounds more super-awesome. I feel like the keyboard case is more of an occasional necessity. OK, fine. I get the point and I don’t completely disagree with it. If you’re of the same mind as these guys, well, then I’m not sure why you’re reading this review. That’s on you. Because I’m here to tell you about my new iPad keyboard cover. Yes, the 2014 keyboard covers are in! 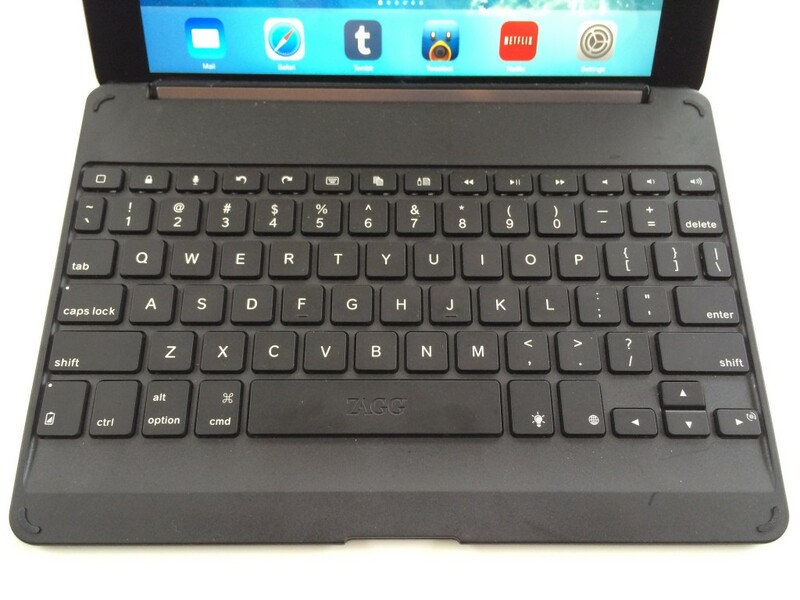 And here’s mine: the Zagg Keys Cover for the iPad Air. Here’s the thing: I love my iPad. I don’t consider it broken without a keyboard because it’s simply a pleasure to use. But sometimes I just want to bang out a whole bunch of text. You can’t do that with the virtual keyboard, at least not quickly and accurately and with any level of satisfaction. 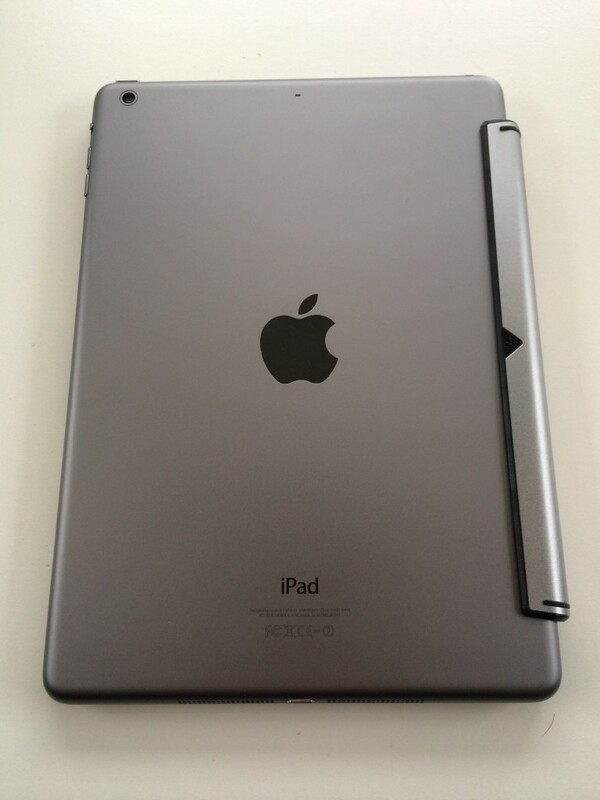 For that particular use case, the one of writing a lot of copy, an iPad by itself is not perfect. But with a Bluetooth keyboard it’s better. And now it’s better still. Betterer, if you will. I know you won’t, but if you would we could live in that world. The world where we say “betterer”. I previously had a Logitech Ultrathin Keyboard Cover with my third generation iPad and had planned to simply replace it when I got my iPad Air in November. It wasn’t a great solution — I found the keys to be too cramped — but it was a solution. Then I saw the press release for the Zagg and decided to wait. Why? Several reasons. 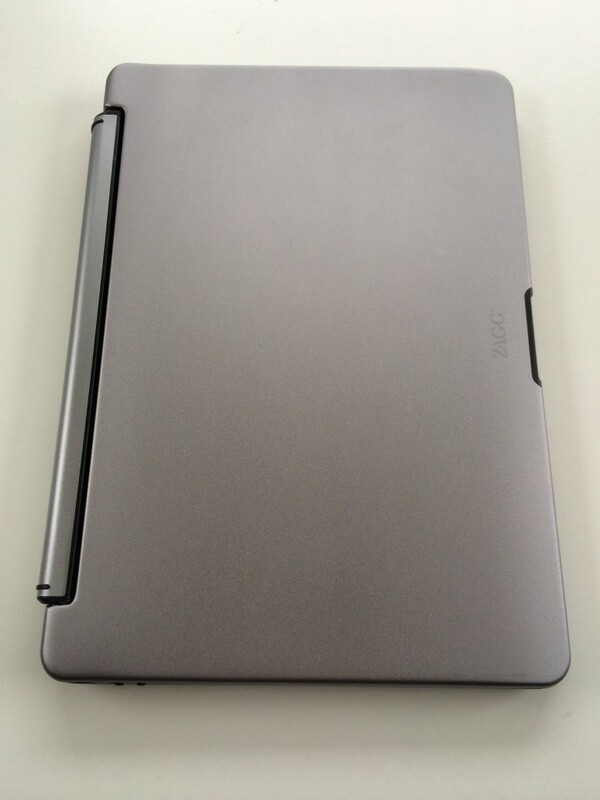 Unlike the Logitech, which attaches to the edge of your iPad via magnets, the Zagg has a hinge that you push the edge of the iPad into and it holds on with a tight rubber grip. This makes an iPad look like the netbook that Apple never built. I had gotten pretty quick at unsnapping the iPad from the Logitech hinge and sticking it in the stand, but it only has one angle. 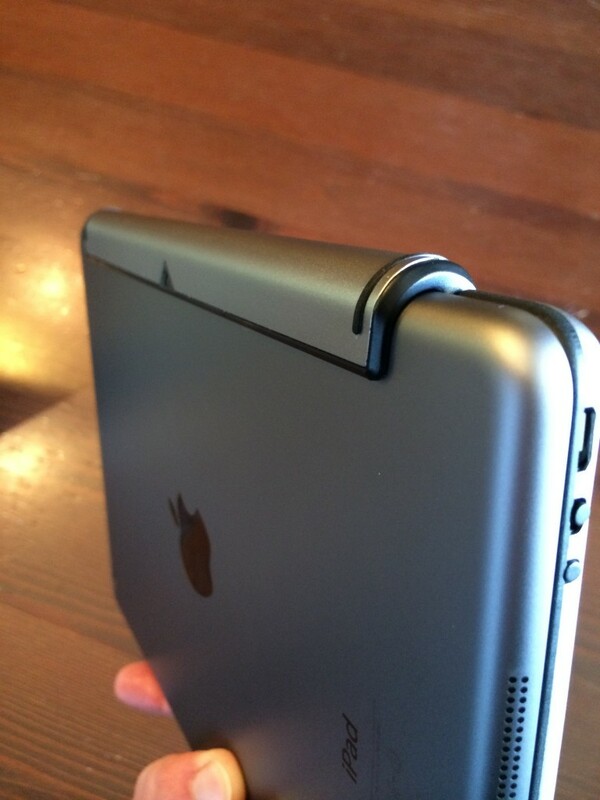 With the Zagg’s hinge, you can tilt it to any angle up to about 140 degrees. It can be quite tricky to get the iPad in and out of the hinge, sometimes it seems like it doesn’t want to go (not in an “Am I breaking one of these?” kind of way). But when it is in the hinge it’s a substantially better experience. 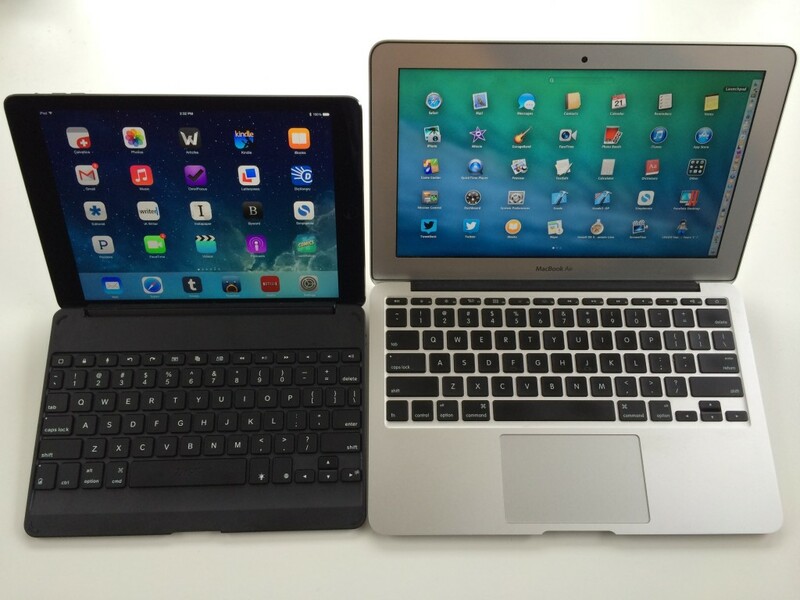 Of course, an iPad Air with the Zagg cover isn’t weighted the same as a MacBook Air. The top is heavier and the bottom lighter, so while it’s perfect on a table top it isn’t always perfect on your lap. But the Logitech was worse. The back face of the Zagg is made of metal, so it’s not much lighter. In fact, the combined weight of the two is not insubstantial but it’s still considerably less than my MacBook Air, which is what it’s all about. Another benefit of the hinge is that it really makes the parallax pop when you tilt the screen back and forth. I sold my Logitech Ultrathin Keyboard Cover with my third generation iPad before I got the Zagg, so it’s a little hard to determine exactly how Zagg did it, but they’ve managed to make the key spacing better. Comparing it to pictures of the Logitech — like the first one after the end of this review at iMore — it seems the keys are slightly closer to the edge and the keys on the edges might be slightly smaller. Whatever the case, I feel significantly happier typing on the Zagg than I did the Logitech. Some of that may also be the keys themselves, which have a firmer action to them. The surface of them also feels better, more tactile instead of just smooth plastic (although, they’ll pick up a little oil as you can see below). And then there’s the backlighting. OK, it’s not backlit like your MacBook is because it doesn’t come on automatically, you have to turn it on and off manually. But, still, it’s backlit and you can set the backlighting to three different brightnesses and seven different shades. If you’re the kind of person who wants a keyboard for your iPad Air for extended writing, the Zagg is a great solution, one I feel I can really recommend. It combines some form of protection for the front of the Air with a solid typing experience, substantially better than the Logitech in my opinion. The Zagg Keys Cover for the iPad Air is $81.28 on Amazon right now (how’s that for a weird price?). If you’re curious, I paid full price for mine — $99 — when I ordered it directly from Zagg earlier in the month. It’s powered by a rechargeable lithium-ion battery and comes with a USB cable. The charge is said to last months of normal usage.